How did you propose? Was it romantic? Sweet? Funny? Tailor-made? Our client Jeff’s was all of that and more. Of all the possible ways to propose marriage to your sweetie, this is my fav. Why? Well, because it was with a framing job from Walkerworks of course! Jeff came in with 3 autographed photographs from Comic-Con. 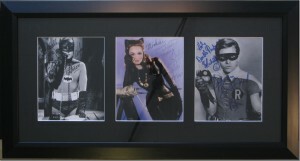 He had “Batman”… Adam West, “Catwoman”…. Julie Newmar, and “Robin”…. Burt Ward. He had met with all of them and asked them to sign their photographs asking his sweetie to marry him. “Michelle, will you marry me? Jeff.” from Adam West. “Michelle, Will you Please marry me, Jeff.” from Julie Newmar. and… “Holy Double Proposal Michelle, best wishes!” from Burt Ward. Jeff had first gone to, ahem, Michaels, where they told him they couldn’t complete his job in time for his proposal. He was asked to delay it. He came to us. Being a small little shop capable of great things, we of course said we could get his framing job done fast and expertly. This was a Thursday and he needed it for Monday. We got it done the next day on the Friday. “Hey Amy….everything went well …my lady friend said “yes”. Thank you both for doing such a great job on short notice to help in making my day turn out to be as special as it was.